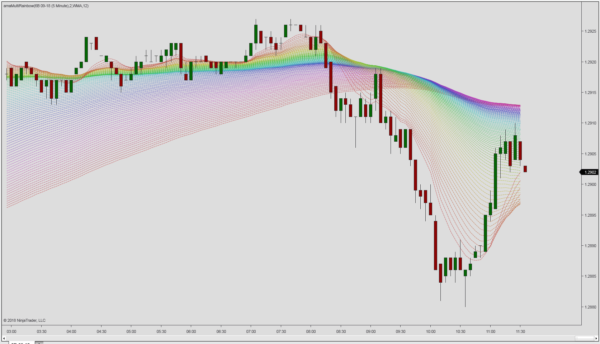 The Multiple Rainbow indicator displays 100 moving averages with ascending lookback periods. The default lookback period for the fastest moving average is set to 12 and can be changed as per user preference. The Rainbow Filter offers a selection of moving averages as input series. The 100 moving average periods are generated by a an increasing increment. If the increment is set to 2, each subsequent moving average will increase accordingly, i.e. MA16, MA18, MA20… unitl MA206 MA208 and MA210. However, as opposed to the other Multi Series indicators, it does not include the Adaptive Laguerre, the Distant Coefficient Filter, the TPOs/VWTPO nor the HoltEMA , as it would require an excess of CPU resources when applied to 100 moving averages.